It’s been a long road for director Alexander Payne to get where he is today. With modern classics like Election, About Schmidt, Sideways and The Descendants all under his belt, he is rightfully now considered one of America’s finest directors when it comes to displaying raw human emotion and interaction. 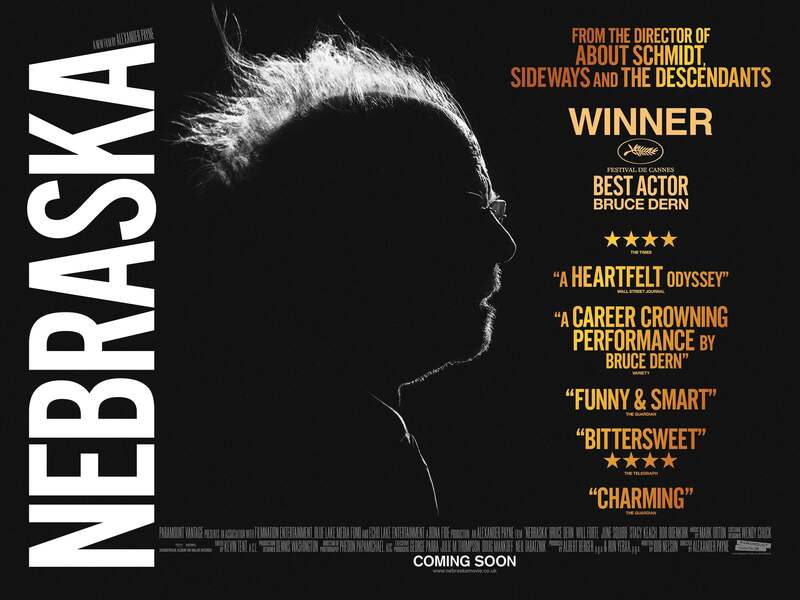 And yet, Nebraska somehow outdoes everything that has come before with what could very well turn out to be his quiet masterpiece. Taking similar themes of family and shattered dreams from his last three films, Payne as a director creates a film which is structurally smaller than before but in doing that creates the “less is more” effect when it comes to representing them. Of course, the main relationship in the film is between father Woody and son David (played by Bruce Dern and Will Forte respectively) and that takes up a good chunk of the film, but how it is done on-screen and how softly it all plays out is absolutely wonderful. We don’t need exotic locations like Hawaii or the California vineyards to play towards the bond that this family has; as long as both parties have that love and respect for one another then for all we care the location can be in a dull, borderline-ghost town. In fact, that is where a lot of Nebraska takes place, when it’s not either on the road or in other locations from motels to hospitals to train tracks. At first glance, everything about this really is dull and uninteresting but we soon learn that it’s all played for laughs. This is a town where the most interesting line of discussion is how many miles per hour people are driving in their cars; otherwise they’re all just slumped onto chairs watching endless television. But of course, like many towns that seem bland and colourless on the outside, there are some hidden truths about its inhabitants that give them some sort of colour. Unfortunately, it turns out that colour is green. When Woody, in his fragile state, reveals his apparent success in winning a million dollars from a sweepstakes letter, everyone suddenly turns friendly and welcoming instead of keeping to themselves. However, you can see as plain as day in their eyes that all they want and care about is the money and not Woody or David themselves. It is even apparent within his extended family, with a vile pair of oversized twins (played by real-life twins Neal and Eula Freudenberg) proving especially greedy and boisterous, even going so far as to try and rob Woody – who lest we forget is a frail old man with his mind on the way out – of the letter using aggressive force and masked as common thieves. Capping off the despicability of the town’s citizens is a former business associate (Stacy Keach) who Woody apparently owes a great deal of money to, and who is sadly one of the only ones who gets exactly what they deserve by film’s end. But what makes all this horridness even funnier is the fact that, as David and the audience have figured out, the sweepstakes letter and therefore the million dollars claim is not real. They’re all revealing their true ugly selves over absolutely nothing. Just the idea of a million dollars instead of the physical appearance of it is enough to bring out the beast, as it were. It makes for a very funny satire of the age-old “love thy neighbour” motto, but also adds some sad and pathetic social commentary that when it comes to money everyone – be it family or friends – is only out for themselves. It makes their eventual downfall even more delightful, especially when Woody’s wife (June Squibb) uses one of the film’s few f-bombs towards them in what has to be one of the greatest heroic moments of the year. Payne serves as director here, providing poignancy and atmosphere whenever needed, but in a rare move did not contribute to the screenplay – that came courtesy of Bob Nelson, who you would gasp in disbelief at when you learn that this was his very first major screenplay. Displaying an outstanding balance of story, character and dialogue that could very easily match some of the Coen Brothers’ earlier work, Nelson knows exactly the kind of story he wants to tell and never deviates from the original focus to create a wonderful cautionary tale of what family you can really trust in situations such as this. It simply oozes with the perfect amount of pathos, never outstaying its welcome but showing up whenever it is needed. His original script is labelled as a frontrunner for some major awards this coming season, and the hype feels entirely justified. As far as debut scripts go, it’s up there with some of the greats. Anchoring everything on-screen, which includes being literally front and centre on the film’s promotional material, is Dern’s incredibly moving performance as Woody Grant. Here is an actor who has spent decades in the profession, taking on character role after character role, and only now with a performance such as this one is he getting the heavy level of attention he so deserves. Cantankerous and ill-judged, but still likable and warm-hearted, the character seems to be everything that Dern has been leading towards all this time and he never disappoints. Forte, formerly known for comedic work on Saturday Night Live and spin-off movie MacGruber, will surprise everyone with a heavy-layered and emotionally deep dramatic performance, proving to be one of the few SNL cast members to make the transition into drama perfectly. But not to be forgotten in the slightest is Squibb as Woody’s long-suffering wife Kate, who if it weren’t for the fantastic performances by Forte and especially Dern would walk away with this movie completely. What she says is funny, what she does is funny; she is just an absolute delight whenever she appears on-screen. The decision to shoot the film in black-and-white may jar some viewers, but like any other film in the same format nowadays it is done for a good reason. Not only does it make for some gorgeous cinematography by Payne regular Phedon Papamichael, but it reflects on the glum realities that this movie both does and doesn’t address. Woody is clearly getting on a bit and needs to be properly looked after, despite his insisting of being fine and perfectly able to still do certain things. To have shot it in colour would have lost its credibility in terms of its storytelling, and it would have damaged the film’s bleak, darkly-comic tone if, say, a later confrontation scene between Woody and Keach’s character Ed were coloured with brown beer bottles and whatever colour shirts. The black-and-white was the best way to tell this particular story, and it is credit on both Payne and Papamichael’s part to still make it look wonderful despite the reprehensible behaviours of these supporting characters. All this and more, as if you needed more, is enough to list Alexander Payne’s Nebraska as this reviewer’s personal favourite film of the year. It’s just a shame it only took twelve months for it to come. Nebraska is the best film of the year (in our opinion, anyway) – the direction is perfect, the writing is perfect, the acting – especially from three leads Bruce Dern, Will Forte and June Squibb – is perfect; the only word to describe Alexander Payne’s newest masterpiece is “perfect”.